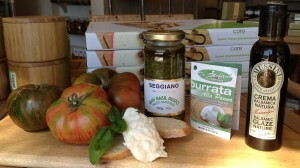 Burrata, Pesto, balsamic glaze and more! We’ve recently expanded our cheese selection to include burrata. Enjoy with pesto, fresh tomato and a balsamic glaze.